For years, NewsBusters and the Business and Media Institute have informed readers about how the press, since George W. Bush was first elected, have tried to create a self-fulfilling prophecy by misrepresenting economic data in as negative a way as possible. This is likely the cause of the public's continued pessimism about economic conditions even as the economy has expanded for 25 consecutive quarters. 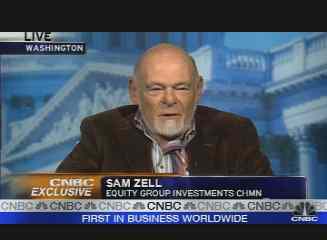 On Tuesday, in an interview on CNBC, Los Angeles Times and Chicago Tribune owner Sam Zell took this thinking a little further when he suggested to "Squawk Box" anchor Becky Quick that many of the economic problems facing the country today are caused by fear-mongering and politicking by Hillary Clinton and Barack Obama. After the Fed made an "emergency" 75-basis-point rate cut this morning, CNBC's "Mad Money" host Jim Cramer, who has gone from bull market cheerleader to bear market doom and gloomer in the last six months, said it was too little too late. "[T]his is obviously the kind of action I was most fearful of - which is that they would have to go panic and that they would get way behind the curve," Cramer said on CNBC's January 22 "Squawk Box." "But, you know but once they do it, I'm less ... I can't hammer them as much. This is the kind of action if they had done it three months ago, we would have been safe." On MSNBC's January 18 "Hardball," Cramer predicted the Dow Jones Industrial Average would decline 2,000 points over the next couple of weeks. However, he was a little less pessimistic after this rate cut. Got some hot stock plays for 2008? CNBC's David Faber thinks you should factor in the recession that hasn't yet happened when you adjust your portfolio for this New Year. CNBC "Squawk Box" contributor Faber warned investors on the January 7 "Squawk on the Street" that stocks reliant on business spending could hurt since a recession, he said, is imminent. "Business spending, concerns about business spending overall. I think Anne Mulcahy [CEO] at Xerox (NYSE:XRX) may have said something about business spending," Faber said. "I'm hearing business spending slowing. That's the concern - what happens to the stock market in a recession because we're heading into one it looks like." CNBC's ticking time bomb Jim "Mad Money" Cramer lashed out at the Federal Reserve again on January 2 for not cutting interest rates. This time he suggesting the Fed was intentionally doling out punishment to reckless investors. Since the stock and credit market turbulence began in July, NewsBusters has been informing readers that media continually predict recessions that never happen. On the sad flipside, bearishness in the press can become so pervasive that an economic downturn ends up being an unfortunate self-fulfilling prophecy. NewsBusters affiliate the Business and Media Institute made this very point in a late-November article by Amy Menefee entitled "Talking Ourselves Into Recession." Who says businesspeople can't get a fair shake from the media? Two days after the U.S. Commerce Department reported an astounding 3.9 percent growth in gross domestic product, the U.S. Labor Department comes in with job data that exceeded analyst’s expectations. The Labor Department reported a gain of 166,000 jobs in October and an unemployment rate that held steady at 4.7 percent for the second month in a row. As Kernen tried to present the skeptics’ side of this debate, the ladies clearly got uncomfortable and, to say the least, a bit defensive with their interviewer.